Justice Onnoghen, appeared in court today, alongside the parties in the suit. The defence counsel Adeboyega Awomolo said that there are about five applications. The first was filed on January 14, 2019, and the second on February 4, 2019. 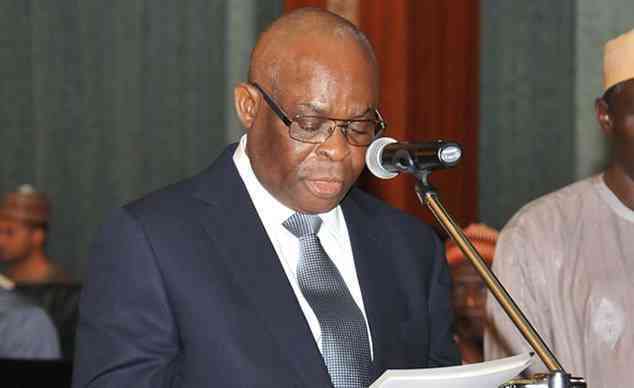 He asked the tribunal to strike out the charge, while prayed for an adjustment to allow the National Judicial Council (NJC) to decide on the issues before the CJN can be tried. In view of the fact that the petition that founded these charges are before NJC. Mr Awomolo further asked the court to take judicial notice that the proceedings had begun before the NJC sitting. The 3rd application was filed on January 31, 2019, in order to ensure fair hearing that the chairman should recuse himself or disqualify himself from the trial. While the 4th application was filed on February 13, asking the tribunal to stay further proceedings and wait for the directive of the appeal court. Counsel to Justice Onnoghen Mr Awomolo said the last two applications have been overtaken by events. But the prosecutor Mr Aliyu Umar said that in respect of the application challenging jurisdiction they filed a written address on January 16, 2019. He added that he filed a counter affidavit in opposing the chairman and a second member of the Tribunal to recuse themselves from the trial. Mr Awomolo said in his argument of the appeal that by Combined reading of the constitution which established the tribunal, “It is a disciplinary court in other to enforce the obedient of the Code of Conduct of Public Officers, it has no penal jurisdiction. It cannot sentence or fine. All it can do according to paragraph 18 subsection 2 is to disqualify candidates etc. “If you take a look at the disciplinary powers of NJC the constitution cannot donate the exercise of the same power to two bodies. “The later provision overrides the former position. “These positions have been established by the decision of this tribunal in the case of Justice Sylvester Nguta”. Mr Nwomolo urged the tribunal to maintain its position in the case of Nguta. Suspected al-Shabaab spy arrested in ManderaBrexit in peril if PM May's deal is rejected: foreign minister HuntEthiopia Airline: Ex-Gov Aregbesola speaks on death of Pius AdesanmiBreaking: Gunmen open fire at polling unit in DeltaBrexit: Could the UK drop tariffs to zero?